The nasal valve is the narrowest part of the nasal airway. It is difficult to explain, anatomically, since it is not made up of only one structure but several structures including the lateral nasal wall, the anterior septum, the head of the inferior turbinate and the osseous piriform aperture. This complicated description means little to most of us and even less when you realize that individual nasal anatomy varies greatly. If you think of the exterior nasal structure it may be helpful to know that the nasal valve is located in the middle to lower portion of the nose. Because this is the narrowest part of the nasal airway, there is a great deal of air flow resistance that occurs in this area and the nasal valve actually works to limit airflow. Nasal valve collapse is a term that refers to any weakness or further narrowing of the nasal valve. Since the nasal valve is such a narrow area anyway, any alteration in the structure of the nose which affects this area can result in increased resistance or even block airflow. Rhinoplasty (plastic surgery to the nose), including "hump removal", is one of the most common causes. Deviated septum is a very common cause of nasal valve collapse. A deviated septum frequently occurs as the result of trauma (injury) to the nose. Trauma or surgery to the nose are common causes of nasal valve collapse. However, nasal valve collapse can occur without any trauma or history of surgery to the nose and can actually be the result of certain inherited anatomical characteristics. For example, an over-projecting nose and narrow nostrils or wide columella (an exterior portion of the nose that separates the two nostrils). Other congenital conditions may also result in nasal valve collapse. Cottle's maneuver - nasal valve area is widened by pulling it in a lateral direction, may be performed. If breathing improves when the nasal valve area is manually widened, it is an indication of nasal valve collapse. Bachman's maneuver. During this maneuver, the nasal valve is widened using instruments and then improvements in breathing are assessed. Acoustic rhinometry - uses sound waves to assess changes in the nasal cavity. The most common treatment for nasal valve collapse is surgery. However, those who do not wish to have surgery or wish to delay surgery may find some relief of symptoms by using a nasal valve dilator. A nasal valve dilator is a device that manually widens the nasal valve. It is usually worn at night. One example of a nasal valve dilator is Breathe Right strips which are adhesive strips that are stuck to the outside of the nose and serve to widen the nose at the area of the nasal valve. This type of nasal valve dilator is available over-the-counter. Other dilators are made of silicone and are worn internally. It should be noted, however, that the use of nasal valve dilators as a therapy or treatment for nasal valve collapse has not been adequately studied at this time. Rhinoplasty with or without the use of grafts are frequently used to repair nasal valve collapse. Sometimes implants are used which hold the nasal aperture open by "spring effect". These implants are often made of titanium. 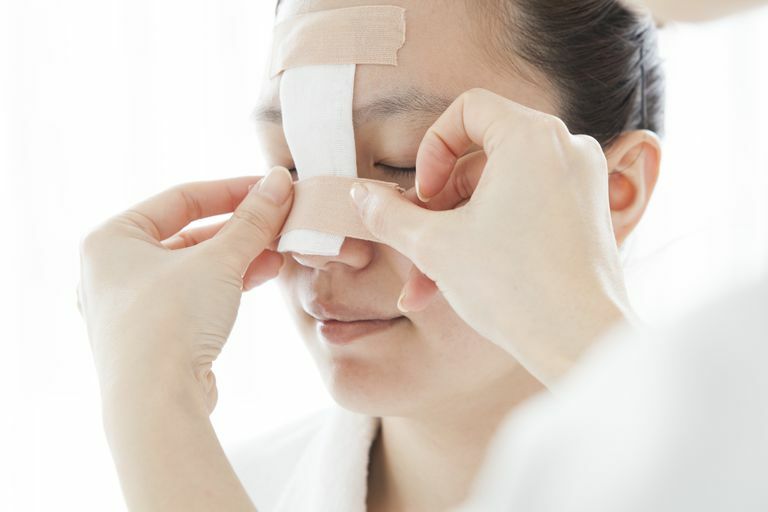 Multiple surgical techniques exist and the technique used varies depending on your surgeon and your particular situation.